Soon to be a first-time dad, Cody Eich is excited about family life as he is about religion, nature, and art. 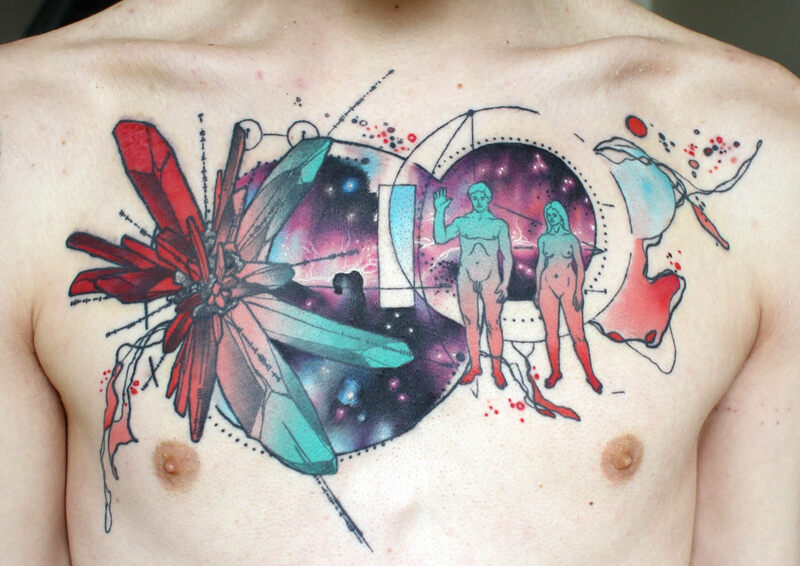 His tattoo creations are visual studies of how everything in our planet, and outside of it, is interconnected. Nature and science come together in his artistic compositions including wildlife, landscapes, humans, biology diagrams and cosmic matter. All expertly done in soothing-color-gradient fills and pen-like outlines, which are some of the traits forming his identifiable art style. Plants and animals are reoccurring subject matters for Eich. My biggest inspirations are things related to nature and living things, generally paired with something geometric or design based. I really enjoy scientific diagrams as well. In college, I started doing artwork based on the natural and geometric elements after working for an engineering firm where I would regularly use programs for computer aided drafting, so everything had to be very precise. 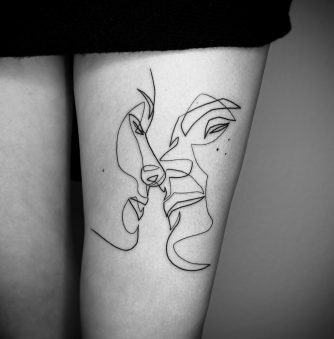 Thomas Hooper in the States, and Maxime Buchi in Europe were two artists who were putting geometry in their tattoos at the time, and when I found them I was immediately drawn to this aesthetic. As far as actual subject matter goes, I love how interconnected living things are and am fascinated by the relationships between everything in nature. The way our planet sits in perfect position in distance from the sun so that humans can survive, how removing one thing in an ecosystem can completely throw the whole thing off. Anything in nature basically. A natural landscape inked in the watercolor style. You are living in Burlington, Ontario. Has living in Canada been an influence for your nature-based themes? I grew up in Durango, Colorado most of my life, which is up in the mountains where nature is very much a part of life. I only moved to Ontario a little over two years ago, although I’ve already been to Algonquin national park several times and really have enjoyed seeing the local wild here in this part of Canada. I don’t know if growing up in Colorado is why I’m drawn to natural things or if it is just because it’s fascinating in general. I just know I am interested in all natural things including underwater life as well as space, down to the smallest cells and atoms. I believe in the God of the bible, which for me, makes the science of natural things and its relationships that much more fascinating. 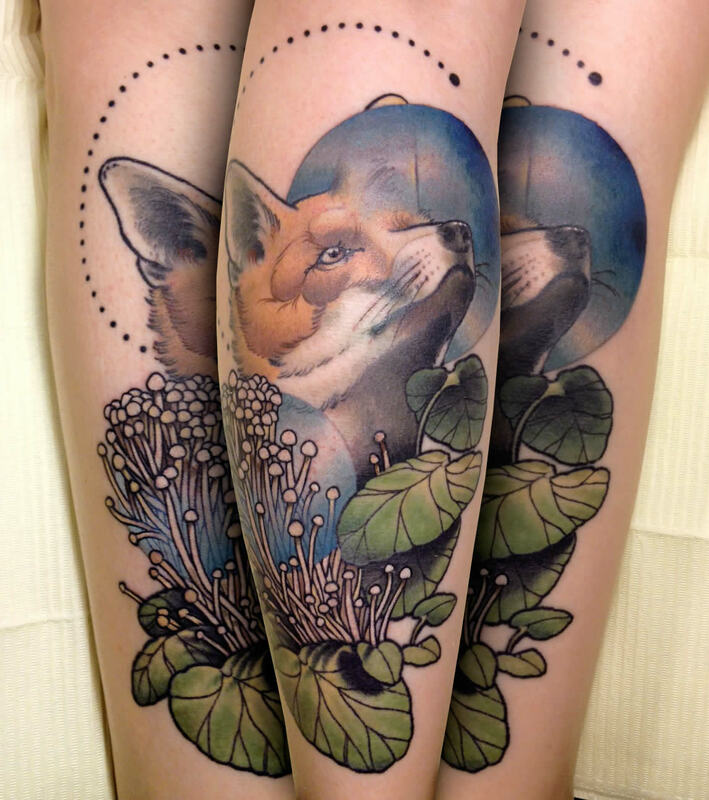 All that to say, that I love when people come to me with science or nature related tattoo ideas! 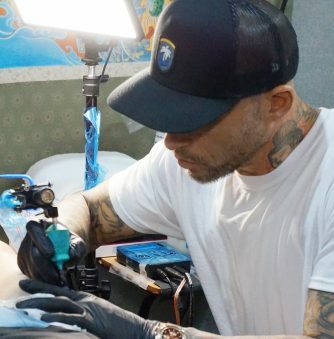 Fortunately, I get the pleasure of tattooing a lot of people in science and biology type fields, so as bad as I was at science, I still get to hear awesome facts and information. Crystals, energy, and the spiritual world. Talking about science and religion can sometimes be a touchy subject. Have you had open/positive discussions with most of your clients? Because my personal goal is that my religion and obedience to my God are increasingly my motivation for everything I do in my life, it is not uncommon for these things to come up in conversation with my clients and anyone else who knows me. Many times throughout the Bible, God is mentioned as being just, right, perfect, and many other things that can be offensive to people. But the Bible also makes it very clear that He loves every single human being with an infinite, unfathomable, and right love, whether they believe that He is their God or not. For me, it is not my responsibility to try to sway anyone (clients or anyone else) one way or another, but it is very exciting for me to have discussions about such things as science and religion and their relationship. I love science, and because many of my clients are very knowledgeable on these subjects, I feel like most of the touchiness goes away with the excitement of learning more about life and the universe. Has there been awkward moments with clients who may have different religious views from you? Evan Dowdell, the owner of Time Will Tell where I work, has done a great job of creating an atmosphere of respect, whether for each other as co-workers or for our clients. At any given time, between myself and my clients, and the other artists in the shop and their clients, there can be a lot of different people who might be talking together with differing views, experiences, and opinions. One of the perks about my job is that while I work I often get to be a part of discussions, sharing with and listening to people from all over the world. Nobody’s experiences are wrong whether I align myself with their religious views or not, and most of the time, nobody is going to convince anyone else that their way is the right way, so I tend to just try to listen and ask questions, and share what my experiences have been while giving the best tattoo I can. So I can’t really remember any awkward moments caused by this line of discussion. 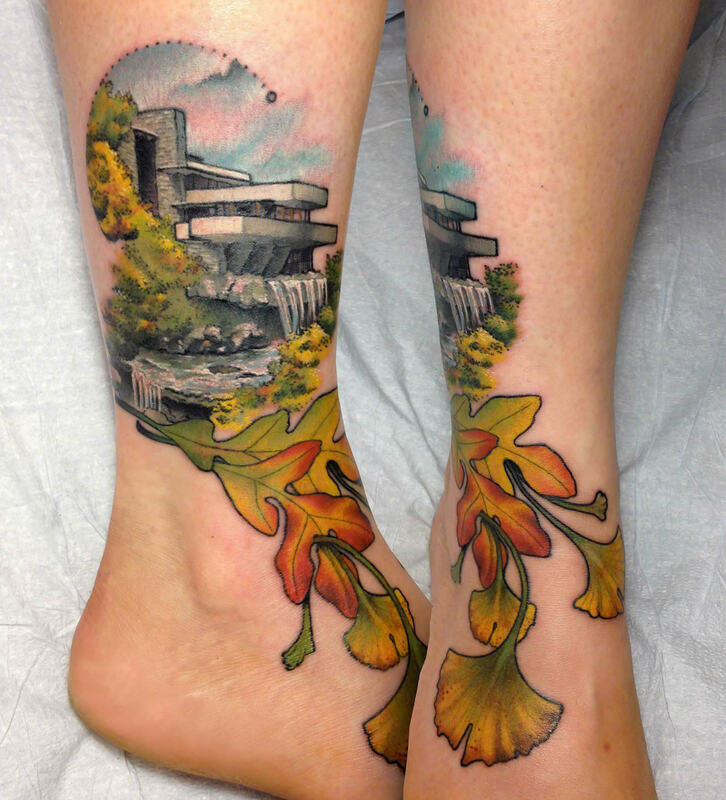 Cody Eich’s take on modern architecture with autumn leaves. 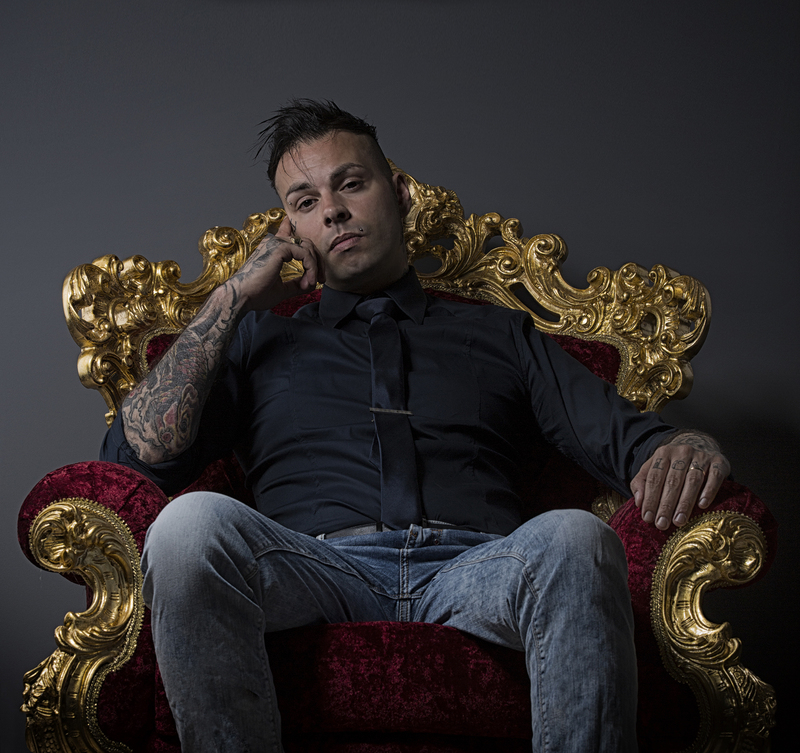 For people looking to get tattooed by you outside of Canada, do you plan on making appearances at ink festivals or elsewhere this year? 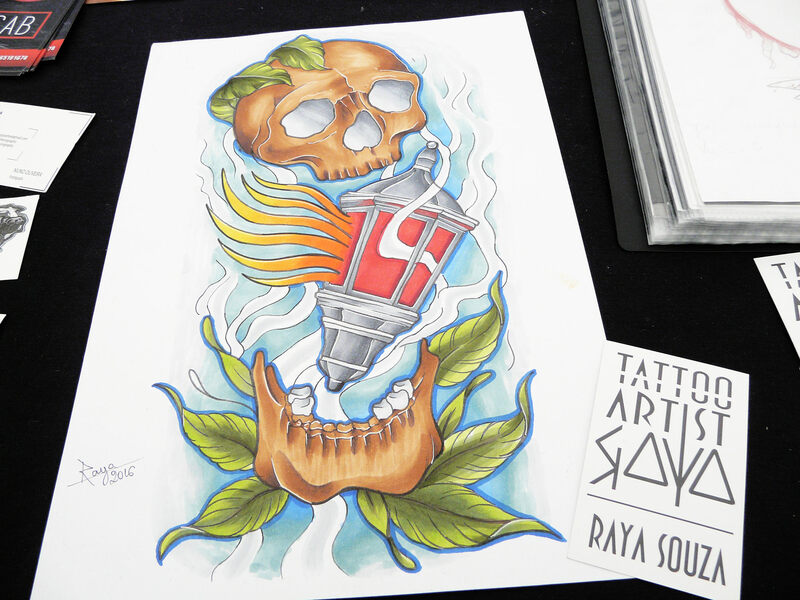 For 2015, I am planning on being at the Halifax Tattoo Festival, Hell City in Columbus, Ohio, and the Toronto Nix Convention, after which my wife is scheduled to have our first baby! So I am planning on laying low from conventions for a little while after that. What are some of your favorite pieces that you’ve created? I’m not good with favorites as I’ve gotten to do some really fun tattoos. 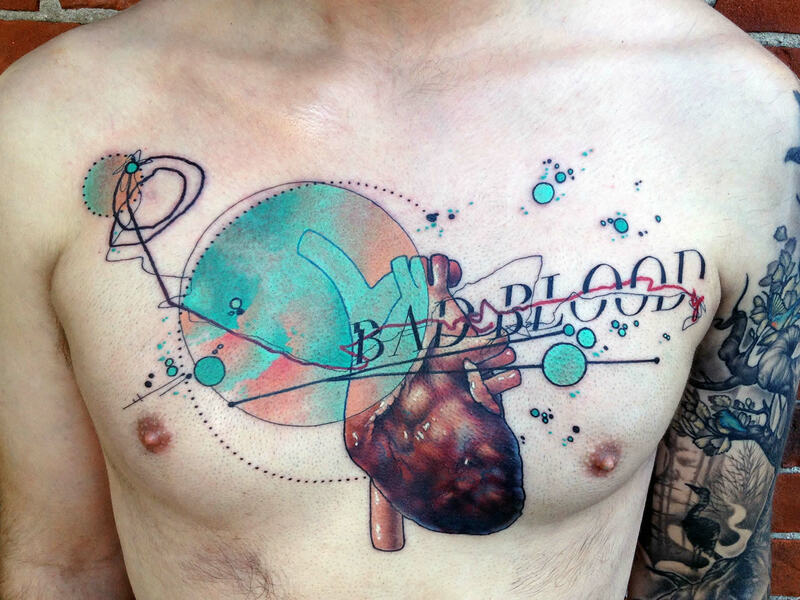 One that I really enjoyed is the “Bad Blood” chest piece with the anatomical heart in the center. It is on a great client who became a friend of mine after I tattooed him, and the piece had a lot of significance for him as well, as it is a piece to celebrate his cancer recovery. Design wise, it only has one real subject being the heart, so the accompanying design work could play a prominent role as contrast in shape and color. 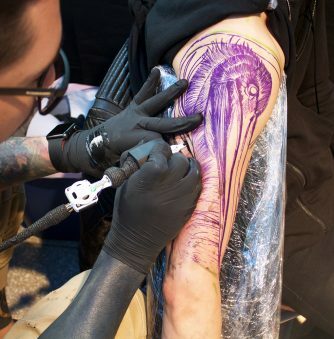 Another would be the hand holding the bird with the geode in it from a while back, as I felt like it is furthering of some of the things I was really wanting to tattoo at the time. Lastly, the fox turning into the geologic scene is another favorite from a while ago for similar reasons. Oh, and the cat with the toast? I had to include that as a favorite. That was a fun day. 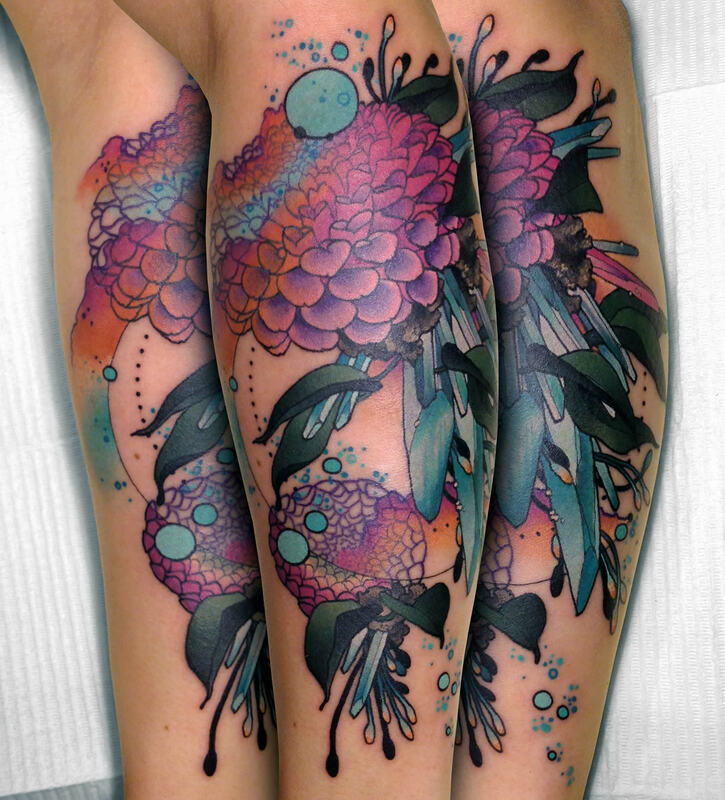 Geometric shapes and colored flowers make a great combination for a tattoo. You have such a well-defined style. 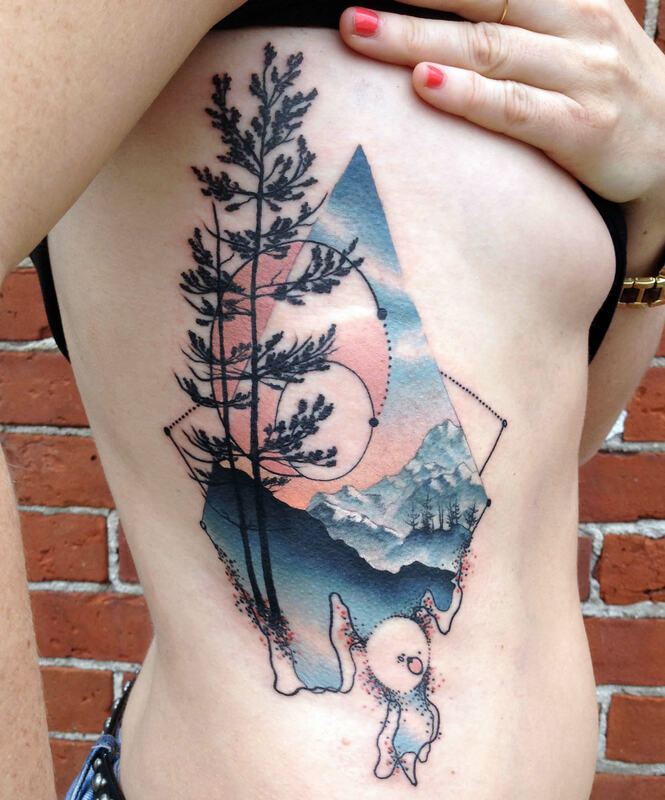 Has it been copied by other tattooers? 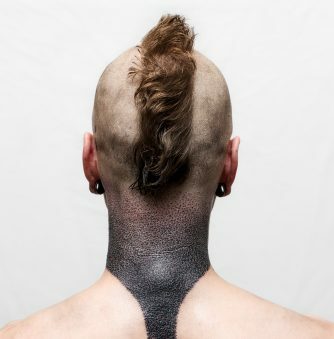 I have seen tattoos that look like tattoos I have done quite a bit. 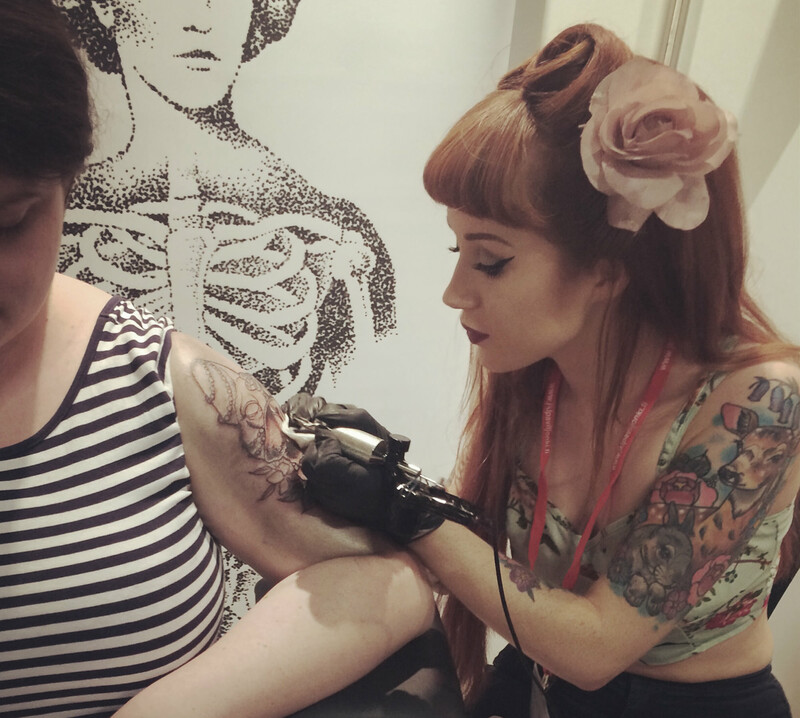 Stylistically, there have been a number of things that I was inspired to put into my tattoos that I have since seen other tattooers do; people close to me unfortunately and others who I have never met. The phrase, “imitation is the greatest form of flattery” may be true, but when the goal isn’t to be flattered, getting your work copied and your ideas blatantly taken isn’t the most energizing thing. 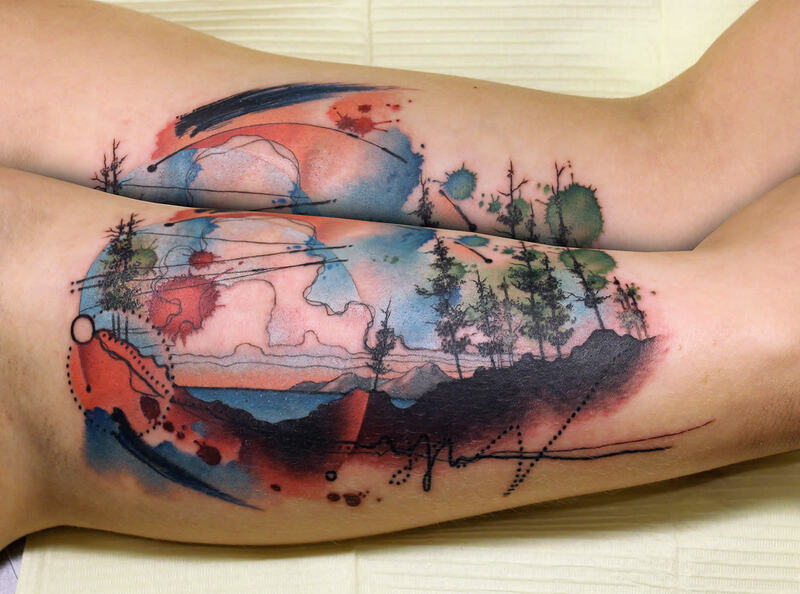 I am not tattooing things that have never been tattooed before, and did not invent anything that I am doing. I have just tried to rearrange things that I have seen (been so inspired by that) and apply the rules of art to them. An art composition that could definitely be printed on an album cover. 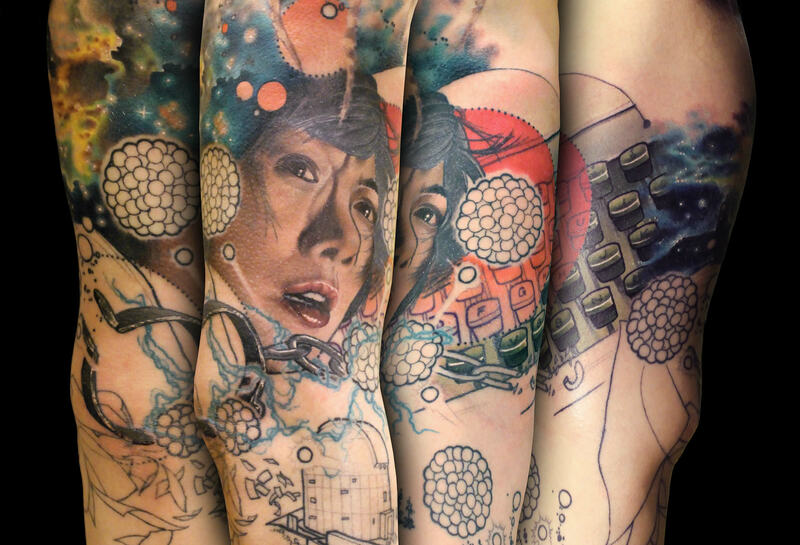 Your tattoos could easily make great album covers. If you could illustrate for a few bands, which would ones would it be? Hmmm, this is a tough question. I don’t know if they would be completely fitting, but I recently saw Odesza in New York and have been enjoying them lately. Also, the newest Caribou album has been on my radar (thanks Tim Mann of Gdansk for the recommendation!… Oh and I designed Gdansk’s latest albums so it seems fitting to mention them too, haha).